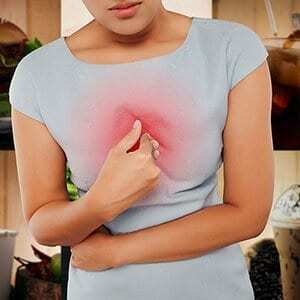 Do you suffer from acid reflux (“gastric reflux”) or indigestion? Your stomach makes acid in order to digest food and your oesophagal sphincter prevents this acid from coming upwards to the oesophagus. If the sphincter doesn’t do its job properly then the acid can spill upwards and cause burping, regurgitation, and a burning feeling above the stomach (“heartburn”). Difficulty swallowing and narrowing of the oesophagus can result if this acid reflux becomes chronic. Hiatus hernia, where a section of the stomach becomes trapped where it doesn’t belong (protruding through the diaphragm) can also be a cause of heartburn or indigestion. Do you eat a natural wholefood diet? People eating a fibre-rich diet rarely suffer from acid reflux or indigestion. It is possible that straining with bowel movements (because you are constipated) may push the upper part of the stomach out of place. Could you have a helicobacter pylori infection? This bacterium is linked to gastric and duodenal ulcers but also to acid reflux. The bacterium secretes urease that produces ammonia locally and that reduces the acidity in the stomach, allowing H. pylori greater freedom to grow. Some medications can cause heartburn (acid reflux). Examples include oral contraception, valium and other benzodiazapenes, nicotine, progesterone and provera. We all need sufficient water to nourish the “mucous membranes” that form a protective layer against stomach acid. If you regularly drink tea, coffee, sugary drinks, excessive alcohol or eat ready meals, these will increase the body’s need for water. If you pinch the skin on the back of your hand, let it go and it does not spring back immediately then you could be dehydrated. Did you know that antioxidant rich foods contain natural substances that help toughen up your stomach lining? If your diet is low in antioxidants, especially “bioflavonoids” (found especially in brightly coloured veg, fruits and spices), then the body may find it diffucult to repair and maintain the digestive system properly. The linings of the intestines can become fragile and prone to damage.